This lovely rosewood finished medal box has a magnetic closure and removable foam inserts that can be cut to fit the item inside. Available in 2 sizes perfect for a medal or challenge coin, the lid can be personalized for your event to create a beautiful presentation. This lovely rosewood finished medal box has a recessed inserts nside. 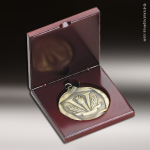 Available in 3 sizes perfect for a medal or challenge coin, the lid can be personalized for your event to create a beautiful presentation.